All these terms can be used for plans where the award is more than just short term and, usually, what you get depends to some extent on how well performance conditions have been met. LTIP awards are all different. You will need to read the information the company provides to find out about your awards. Companies can pick whatever name they like for their plan. One company’s LTIP may be very different from another’s. Usually, if an LTIP award pays out, you get the whole value of the shares that have been earned, or vested – although there will be taxes that have to be paid. LTIP awards are normally only intended for selected employees. Senior employees who can most influence how the company performs are normally the ones who get to participate in this type of plan, although it’s possible to include more junior employees or even to run the plan on an all-employee basis. Information about the awards may well be available on the company’s website- for instance in the Directors’ Remuneration Report in the annual accounts of a listed company. Awards can be of any type, usually they are contingent share awards or nil-cost options meaning that you get the full value of the number of shares that vest. Sometimes they are awards of restricted shares. Normally an LTIP doesn’t offer any particular tax advantages and so the value is subject to employment taxes– although occasionally a tax-advantaged CSOP option might be included as part of a company’s LTIP arrangements. Often, performance is measured over a period of 3 financial years of the company. Increasingly, you can expect there to be a further period, typically an additional 2 years, before you can get the full value from your awards. This may be called a retention period, or deferral period, or holding period. Sometimes employment taxes arise at the start of the retention period, sometimes only at the end (see below). If employment taxes are triggered before the end of the retention period, it is normal for participants to be allowed to sell enough shares to cover their tax and national insurance contributions, but they may not be able to dispose of the rest of their award shares until the retention period has ended. These days it is quite common for LTIP awards to be subject to both ‘malus’ and ‘clawback’. Malus is the right for the awards to be adjusted before they pay out if, for instance, the company has performed especially badly or its financial information has been mis-stated, or the participant is responsible for failure of risk management or is guilty of misconduct. Clawback is the right for the company to reclaim some of the award value for a period after the award has paid out, if something serious is discovered. What are the performance conditions? The most common ones to choose are Total Shareholder Return or Earnings Per Share. Companies may be encouraged to use measures that are particularly relevant to the company and its strategic objectives, so there can be lots of variations. The performance conditions should be set out when the award is granted. It’s worth understanding what the performance measures are and how they will be assessed. Normally, the remuneration committee of the board of directors of a company whose shares are publicly traded will review the level of performance once the performance period has ended, before confirming how many of your award shares will vest. That will depend on the award type. Usually the awards take the form of Contingent Share Awards or nil-cost options. Usually the value is subject to employment taxes at the point at which you get the shares – but there can be different tax treatments especially if the plan involves restricted shares or convertible shares. If there is a holding period, your award shares may be restricted shares until the end of the holding period. Some basic information about the type of award, the tax treatment you can expect and the time when you will be taxed on the value of your awards shares should be provided to you when your award is granted. It sometimes happens that on the same day you acquire shares under the LTIP and also shares under a tax- advantaged CSOP or SAYE plan and you need to sell some of them to cover taxes. In this situation you might want to elect to override the normal share identification rules and instead be treated as selling the non-tax advantaged ones first using the special rules for same day share acquisitions. Depending on your circumstances, doing this could avoid tax becoming due when you didn’t expect it. Will people get to know about your award? That depends how senior you are and what kind of company it is. If you are a director, you should assume that information about your awards will become public one way or another. If the company’s shares are publicly traded, announcements have to be made to the market when there are dealings in shares by directors and certain other senior people and information about the awards and shareholdings of individual directors have to go into the company’s audited accounts. When can you exercise your award? Can you sell your award shares? It might not be as clear cut as you would like. are you restricted from dealing in the company’s shares during a closed period? the normal vesting of awards may be deferred if the company is in a closed period. 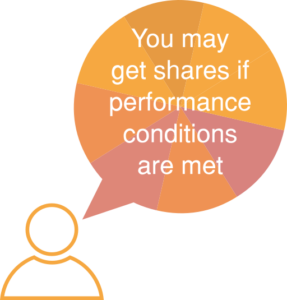 have you complied with your company’s share dealing code? You may be required to get permission before you deal. Exercising awards can count as dealing, even if you don’t sell any shares at that point in time. are you expected to build up a particular level of shareholding? For instance, some companies expect their senior people to hold shares with a value that is at lest as big as their annual salary, sometimes more. Bear in mind that if you have different shares in the company, acquired at different times, some of them subject to restrictions (for instance because they are still in a retention period) and some of them not, when considering a disposal of shares you might need to be especially careful about the capital gains tax share identification rules. You may well decide to seek individual advice, particularly if the amounts are significant. It’s worth taking the time to read the information they have been given and ask questions about any things that seem unclear. If there is an external share plan administrator, there may be more information if you log in to your account on their website. There may be a helpline that you can call. LTIPs and PSPs and the awards made under them vary so much that we can only include very general information on this website. Your award will usually be a conditional share award or a nil-cost option. Usually the award only vests if specified company performance conditions are met over a period of at least 3 financial years. Employment conditions will usually apply too. Once the award has vested, there may be a further holding period during which you are not allowed to dispose of your award shares. If your award is a nil-cost option, you have to exercise it during the exercise period in order to get your shares. With this type of award, the shares aren’t delivered automatically. Employment taxes will be due on the value of the award shares that you get. Your employer will usually have to account for the taxes under PAYE and may put in place arrangements so you can sell enough shares to cover the tax amounts you have to pay. LTIP awards may well be subject to malus and clawback provisions.